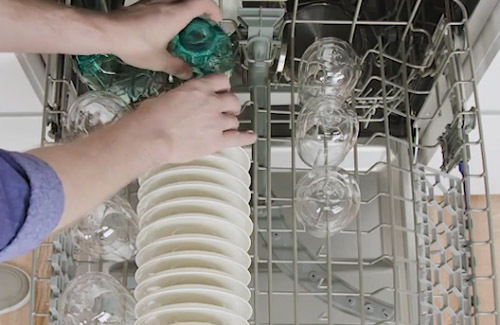 Follow these step by step instructions to get the most out of your dishwasher and quick start your new convenient dish washing routine at home. 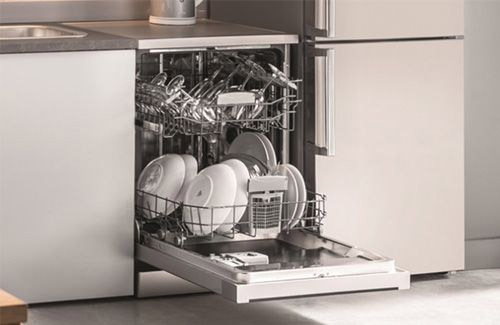 Load up your dishwasher, taking care that the rotating arms are not obstructed and that items are placed in the racks correctly. Place a dishwasher tablet in the holder and close the flap. Ensure that there is rinse aid and salt in your machine if you are not using a 3-in-1 tablet. Turn the dishwasher on using the power button on the control panel. Select the programme for your wash.
Set a delayed start using the delay timer, if required. Close the dishwasher door and the machine will start automatically. How to load a dishwasher properly? Put items in handle down to allow them to be washed thoroughly. Always wash sharp knives by hand to avoid blunting them. Put knives, forks and spoons in their own sections together to save time when unloading. Long handled items should be placed on the top racks to avoid preventing the spray arms from rotating. Remove large pieces of food before washing. Do not wash bone handled knives or silverware in the dishwasher, the detergent will ‘pit’ the surface of silver and the heat will damage bone handles. Use the grid system to lay items on their side. This will hold them in place, separate from other cutlery and allow them to be washed thoroughly. Place similar items next to one another to save time when unloading. Should you rinse dishes before putting them in the dishwasher? Like washing machines, fan ovens and even our cars, everything has become more efficient in our lifetime. Once upon a time, it was necessary to pre-rinse plates and bowls before they went into the dishwasher to give the machine a fighting chance of getting everything clean. Now, that is not always the case. Nowadays, your dishwasher has built in sensors that detect food particles and pre-wash your crockery accordingly. There is a filter to capture bits before they go down the drain pipe and the settings are automatically adjusted with each wash to cope with the soil level on your plates. Simply scrape the largest bits of food waste into the bin or composter before you want to load the dishwasher and let the machine do the rest. In fact, pre-washing could waste more water than your dishwasher will use, defeating the point of upgrading for efficiency. 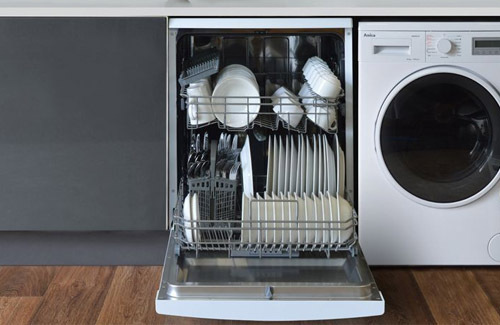 There are a few things that you can check if your dishwasher is not cleaning properly. Firstly, is it loaded correctly? If there is a large baking tray or pan blocking the rotating spray arm from rotating then the water and detergent will not be reaching the plates inside. Are there items piled on top of one another, not allowing water to get in between? It might be worth checking the loading diagram in your appliance’s manual to ensure that you are giving the appliance the best chance of washing everything efficiently. You can also remove and clean the rotary arms in case they are clogged up with dirt. This will improve wash results. Is the tablet being released during the wash? If the trap door is not opening then your machine is trying to wash with just water. Is there a fault on the control panel? This will highlight if there is a problem with the water getting to temperature or if not enough water is coming in to the machine. Are the rinse aid and salt levels topped up correctly? Ensure that you clean out the filter. Any greasy food residue will affect the wash results in your dishwasher. If all these things are OK, give our friendly customer care team a call on 01949 862000 to diagnose the problem. Rinse aid is added to your machine to help with the drying of plates and dishes. It is specifically designed to help this process so make sure that your levels are topped up. Plastic doesn’t dry as well as ceramic or glass in your dishwasher because it doesn’t retain heat. It is the heat retained by the material that enables water droplets to be evaporated from the surface. Models with our active drying system will dry the plastics better than those models without. Ensure that there is space between the items when loading to allow for efficient drying at the end of the cycle. Keep the rinse aid levels topped up. Open the dishwasher at the end of the cycle to allow steam to escape. Unload the lower rack before the top rack so that the water doesn’t spill out onto the items below. Why do dishwashers make glasses cloudy? This problem is caused by either limescale deposits or by gradual wear on the glasses. If you have hard water in your area, limescale may be the problem you are experiencing. This problem can easily be rectified by using dishwasher salt and rinse aid in your dishwasher to combat the mineral deposits in the water. If your glasses have become worn, we cannot fix this but we can prevent it from happening again. The special glassware wash programme on our dishwashers uses a gentle wash cycle to take care of your most delicate items during the dishwasher cycle. 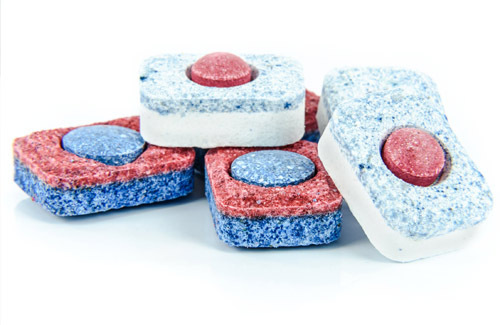 Dishwasher detergent is abrasive and can dull the sharp edges on knives. We recommend that your chef’s knives and other items that you want to keep sharp are washed carefully by hand instead.